Korean transport ministry has launched an emergency safety inspection on Boeing 737 Max planes in the wake of a series of deadly crashes in the same model. 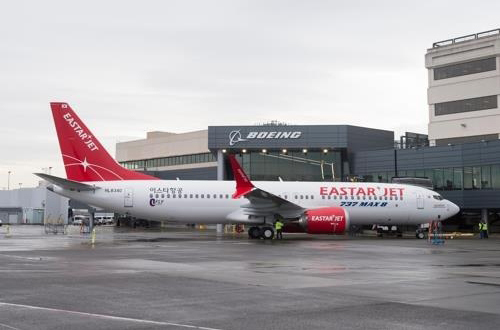 Budget carrier Eastar Jet currently has two Boeing 737 Max planes that fly regularly Japan and Thailand. Korea’s other major airlines including full-service carrier Korean Air Lines and budget carrier Tway Air have plans to add up to 100 Boeing 737 Max to their fleet over the next years. The Korean transport ministry will conduct thorough inspection on the active Boeing 737 Max planes and decide whether to endorse further imports. The emergency inspection on Boeing 737 Max plane comes after Nairobi-bound Ethiopian Airlines Boeing 737 Max flight crashed shortly after take-off, killing all 157 people on board on Sunday (local time). The victims included eight Chinese people and the Beijing government has ordered domestic airlines to suspend operation of the Boeing 737 Max planes. In October last year, Indonesia’s Lion Air 737 MAX 8 flight went down in Jakarta just 13 minutes after take-off, killing all 189 people on board. 5S. Korean companies turn optimistic about their business in China in Q..
6Korea has role regionally in ASEAN and bilaterally with Thailand: envo..